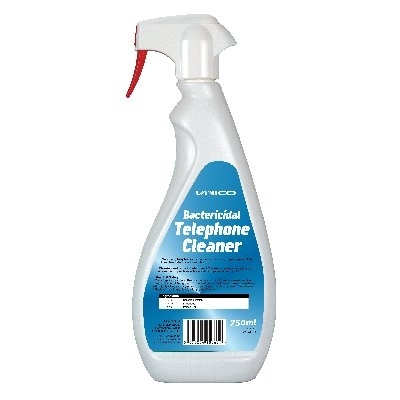 UNICO BACTERICIDAL TELEPHONE CLEANER 1 x 750 ml Developed for cleaning and disinfecting telephones, headsets and similar devices. It can also be used to clean, disinfect and reduce static on PC screens, monitors and television screens. HANDY GLASS CLEANER 1 x 750 ml Ready to use Alcohol based for a sparkling streak free finish. Biodegradable and ammonia free, this cleaner will remove marks, stains, atmospheric grime, insect debris, nicotine and smoke haze. Also suitable for use on Stainless Steel . Multi Surface Cleaner with Bleach 1 x 750 ml Ready to use This ready to use cleaner removes mould and mildew, soap scum residue, grease and oil from sinks, wash basins and bathroom tiles. Leaves a pleasant fragrance.